Use DDF Glycolic Toning Complex to eliminate debris and refine skin. Deeply purify skin with this glycolic acid toner. You need a highly concentrated product with serious exfoliation to refine a rough and uneven texture. DDF Glycolic Toning Complex contains a high concentration of glycolic acid which is one of the most effective exfoliating ingredients available. This toner reaches deep down into pores to purify them of oil, makeup, dirt, dead skin cells and debris. Removing these impurities minimizes the look of enlarged pores and helps control the production of oil. The exfoliating ingredients in this toner also encourage cell turnover which fades the appearance of signs of aging including fine lines, wrinkles and dark spots. Soothing and hydrating ingredients prevent irritation caused by exfoliation including redness, flaking and dryness. You can use this product as your daily cleanser or after your regular cleanser as a toner. 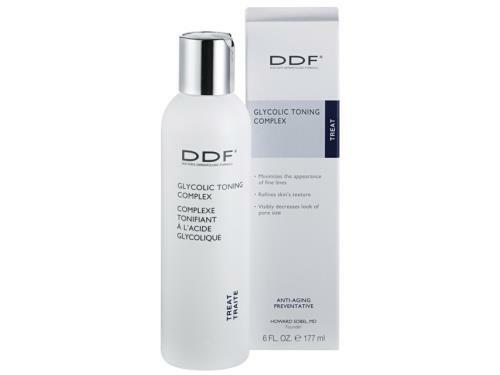 Refresh and refine skin with DDF Glycolic Toning Complex. Tell us your thoughts about DDF Glycolic Toning Complex and receive 50 rewards points! This is the one product in my beauty regime that I can not run out of. As soon as I have used half of a bottle, I order another one. I use it as a toner after washing my face and it keeps my skin blemish free and fresh. Can't live without it. DDF is amazing. This toner does sting a little, but it helps your skin. I never used toner. Now, it’s a must. I love this product. I started using it 8 years ago, as it was recommended at a med spa. It’s not sold in stores like it was before. I’m so glad LovelySkin carries it! It leaves my skin fresh and clean without a harsh sting but just enough of a tingle. I use it after I wash my face at night and before any other product. DDF Glycolic Toning Complex is the best! Been using this for years and love, love, love it! Not too harsh but really refreshes my skin opens up the pores and just makes it glow. Definitely, recommend. I have been using this for about 3 weeks. It tingles on the skin but it is meant to. I bought this in the hope it would clean out all of my pores. It hasn't completely removed all the clogged pores from around the side of my noise but on top they seem to have gotten smaller. The wipes look dirty after I have wiped my face which tells me also it's doing a good job. Doesn't smell great but I don't mind that. Don't expect it to. My moisturizer sinks into my skin more and make up is going on well. I use this a.m and p.m. Though to remove the last stubborn clogged pores I feel one of those metal tools will help. The best toner for oily skin! I've been using this for 10+ years and it is the best toner for oily skin. It leaves my skin feels so fresh and clean and it definitely helps prevent from having blemishes. I tried other toners a few times but I could not find anything better than DDF. Bought this based on the positive reviews, so glad I did!!! Noticed smoother skin within days of use! I have been using this tonic for a couple years, my skin looks healthy and glowing. Highly recommend this product. This is my first time trying a glycolic toner. I strayed from it thinking it would be to harsh on my combination skin. I get why people use it---it works great! You can fee l it working as soon as you sweep it on. It is not over drying nor irritating. And I have some acne going on so I use acne medication , as well, but it does not seem to cause any extreme dryness nor redness. I definitely give this a 2 thumbs up! I love this toner. I have been using it for 6 years, and I always get compliments on my skin. It made my laugh lines disappear and keeps my acne at bay. The service and shipping from this company are wonderful. Thank you for shipping to APO addresses. I have recommended this product to my friends and family. I have been using this product for the past couple of years now. Used to buy it from Sephora until they discontinued selling DDF there. Toner helps keep my face from becoming oily and controls any acne breakouts. I always use a moisturizer after using the product so I never have any issues with dryness. This is the best toner ever! Keeps my skin youthful! Pour into a pump spray bottle to make product go further. I've been using this toner for a few years now. It stings at times after application but i've kept using this product because of the results. It keeps by skin clean and acne free. I have oily skin and large pores. This toner is awesome at removing left over make-up and soap after washing. It gave my skin an even glow, made my pores appear smaller and kept my skin from getting oily without drying. I really like this product and will continue using it. Highly rcomended you Kathy, it has the highest % of glycolic--I love it because it keeps the 'brown age spots' ay bay. I have used this product for over 12 years, maybe more, and like the tingling effect. I love this Toner. It's the best out there. Keeps blemishes away and improves texture of the skin. I recommend to anyone with occasion breakouts and/or acne. I use after washing with Blemish Foaming Cleanser. I love this product more than ProActive! You will not be dissapointed. Great non-irritating toner for combination skin. Balances oily & dry areas and assists in more effective moisturizing. Dissolves old skin cells that can mix with oil and block pores. I use this toner every evening after washing my face. It has truly helped clear my breakouts and even prevents new ones. I suffered with little white bumps on my chin for years and this is the only product that I've ever used that actually helped me. It's far more effective than any salicylic acid products that are out there. I highly recommend this product.